According to Statistics Finland’s preliminary data, prices of dwellings in old blocks of flats and terraced houses went down by 0.7 per cent in the whole country from June to July. In Greater Helsinki, prices went down by 1.1 per cent and in the rest of the country by 0.3 per cent. Compared with the corresponding period of the previous year, prices grew by 0.7 per cent in the whole country. 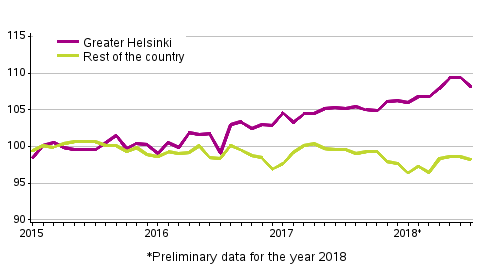 In Greater Helsinki, prices went up by 2.8 per cent, while in the rest of Finland they went down by 1.3 per cent from the year before. In July 2018, the average price per square metre of an old dwelling in a housing company was EUR 2,119 in the whole country, EUR 3,652 in Greater Helsinki and EUR 1,657 elsewhere in the country. According to data available to Statistics Finland, 31,835 transactions of old dwellings in housing companies were made in the whole country in January to July. The number of transactions was 9,315 in Greater Helsinki and 22,285 in the rest of Finland. In the corresponding period of last year, 32,018 transactions were recorded in the whole country. In Greater Helsinki, the number of transactions was 9,227 and in the rest of Finland 22,791. ISSN=2323-8801. July 2018. Helsinki: Statistics Finland [referred: 22.4.2019].